The response from students around the country to our #OceanTransformer poster and message competition was incredible. Hundreds of entries were received and they showed that a passion and commitment for change in our world is strong. Second year students Lucy, Moya and Sophie from the Presentation College, Headford in Galway won the #OceanTransformer poster competition. Third class student Ali from Mount Anville NS in Dublin claimed first prize for her class in the #OceanTransformer message competition. Leading musician and environmentalist Sharon Shannon was so proud to see so many inspiring entries from across the country. Sharon believes that children can influence shopping habits and waste management at home and help influence change in their schools and communities. The Ocean Transformers who entered our competition are proving her right! NUIG Science amabassador and Marine biologist Catherine Jordan was delighted at the response of young #OceanTransformers to the competition. Catherine feels that the awareness and determination for a better world among young people can help turn the tide of pollution in the years ahead. Two of our judges artist Fiona Concannon and writer and publisher Marguerite Tonery were really impressed with the power, emotion, passion, creativity and vibrancy of the entries. As a result of Lucy, Moya and Sophie’s creativity they have won a trip for 25 to Leisureland, Galway for an afternoon. No doubt you will all enjoy its award winning pool followed by a round of Adventure golf. Salthill Village and Steeltech supported our idea to challenge the imaginations of students throughout Ireland. Our ocean and marine life are drowning and dying in a sea of plastic pollution. The will and call to action to end this is growing with young people leading the fight. With the #FridaysForFuture movement growing it is clear that young people have the power to make real change happen. This idealism can help make our world a better place to live for future generations. 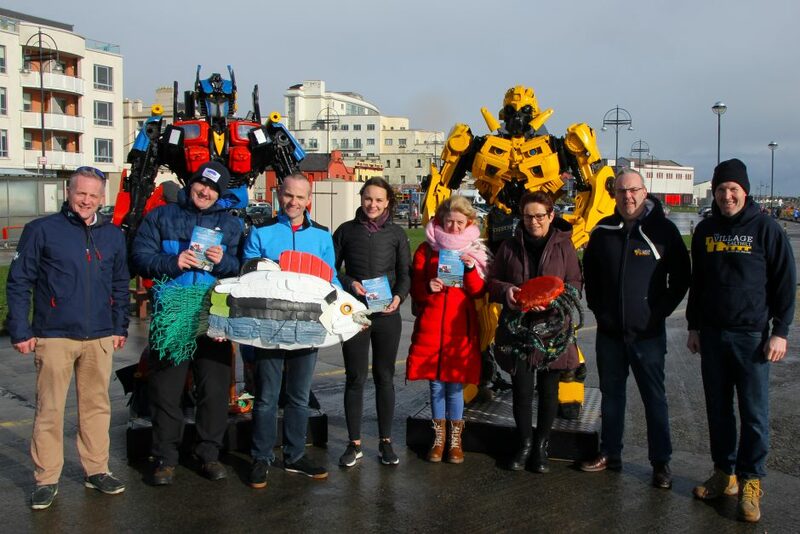 The winning entries and selected runners up will be displayed at the National Aquarium in Salthill, Galway as part of a plastics pollution #OceanTransformer exhibition. Thousands of visitors will get to see the inspirational posters and messages in the coming months. Inspiring You will display a selection of messages and posters each Friday in support of the #FridaysForFuture movement. We will make contact with the “Highly Commended” students in the coming days. A small gift will be sent as a gesture of appreciation for their dedication and contribution to inspire change in our oceans. Thanks to all the staff, parents/guardians and students for helping us inspire a brighter tomorrow. We would love more ideas so feel free to email us and together we can inspire others.